Reptiles are not as many as mammals or fishes but they are definitely amongst the most remarkable and unique animals in the world. Here are some reptile species and their weird and bizarre traits and characteristics. Whiptail Lizards are amazing reptiles. 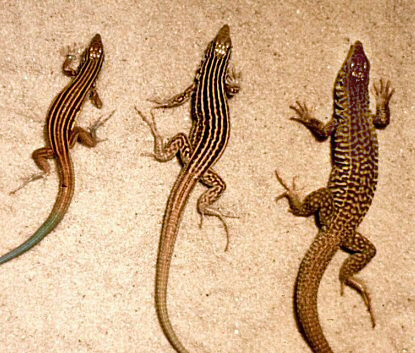 In the world of Whiptail Lizards, male species are not needed – the species is 100% female. All the male Whiptail Lizards are dead. Alligator Snapping Turtle are unique reptiles. Their tongues are uniquely structured. Their tongue looks like a worm, so it attracts fish. Basilisks are very fast-moving creatures. They move so quick that it can run on water at a speed of 5.4 km/h. Chameleons are peculiar animals. They are amongst the animals with the longest tongues. They can't be seen with their amazing camouflage. Komodo Dragons are the largest living lizard in the world. Their saliva has four kinds of deadly bacteria and can paralyze its prey with one bite. Crocodiles are amongst the most dreaded animals in the world. Their bite has been measured at 3,000 lbf/in²; making them the strongest biters of all animals. Crocodiles are great hunters too. They are regarded as the “perfect predator”. They can wait a year to attack. The mouth of the Saltwater Crocodile makes up 15% of its body length. The traditional belief that female alligators consume their young is false. Female Alligators keep their young in their mouth while going over rivers to protect them from potential predators. They do not live in the sewers of New York City because sewers are too cold, dark, and polluted. Reptiles are amongst the most venomous creatures on earth and one of them is the Gila Monster. As their name suggest, their teeth contain venom; the more it pierces, the more venom it puts into you. Geckos are extraordinary reptiles. They are amongst the few animals that can cling to any surface, even upside-down ones. Horned Lizards are bizarre reptiles. They’re the only species on Earth that can squirts blood from their eyes. Turtles are amazing animals. Their shell can protect them from something 200 times its own weight. Is it okay for a person (especially a woman) to flirt? Well, it defends. In the animal kingdom, Travancore Tortoises are considered as the most outrageous flirts.